December 2017 “When an artist uses a conceptual form of art,” wrote Sol LeWitt in Paragraphs on Conceptual Art (1967), “it means that all of the planning and decisions are made beforehand and the execution is a perfunctory affair.” Fifty years later, it seems that too often the decisions that imbue a work of art with meaning are made after the fact. An exhibition might consist of a decontextualized piece of theory here, some found objects there, a vaguely suggestive title and a sociopolitically conscious write-up penned subsequently in vernacular that manages at once to sound objective and say very little, and whose comprehensiveness (if not relevance) renders the art object redundant anyway. Yoshinori Niwa’s practice may not be squarely conceptualist, but it is undoubtedly an art of concepts, and he addresses them in his markedly self-contained works with exactly the sense of balance, clarity, humor and purpose that is so sorely lacking elsewhere. Each of the four video installations in That Language Sounds Like a Language at London’s Edel Assanti gallery bears a long title that is at once irreverently funny and descriptive, rather than an expositive distillation of the artwork’s essence. In each case, the artist integrates idea and object with a sense of symmetry, while leaving room for the meaning of both sides to develop as the viewer looks on. Whereas so much contemporary art merely claims to “explore” some topic of interest, these works get on and do so. In—prepare for the first mouthful—Asking Taiwanese People to Sing the National Anthem of the Republic of China While Listening to the National Anthem of the People’s Republic of China (2014), for instance, title and video are balanced in their expression of content. The work takes a humorous but surprisingly emotive approach to the dissonance that has existed between the “Two Chinas” since the end of the Civil War in 1949, which saw the founding of a new People’s Republic and the existing ruling party’s displacement to Taiwan. As the video’s two singers and small, uniformed band iteratively attempt to square the lyrics of one anthem with the melody of another, the gaps between words, ideologies and notions of nationhood appear like false notes in a harmony whose path to resolution is uncertain. In another piece concerned with Taiwan, Requesting People in Taiwan Who I Met by Chance to Declare That If They Die, Taiwan Will Disappear (2014), Niwa unpicks the idea of statehood by suggesting that it is, like nationhood, defined by people and not merely an abstract legal status. 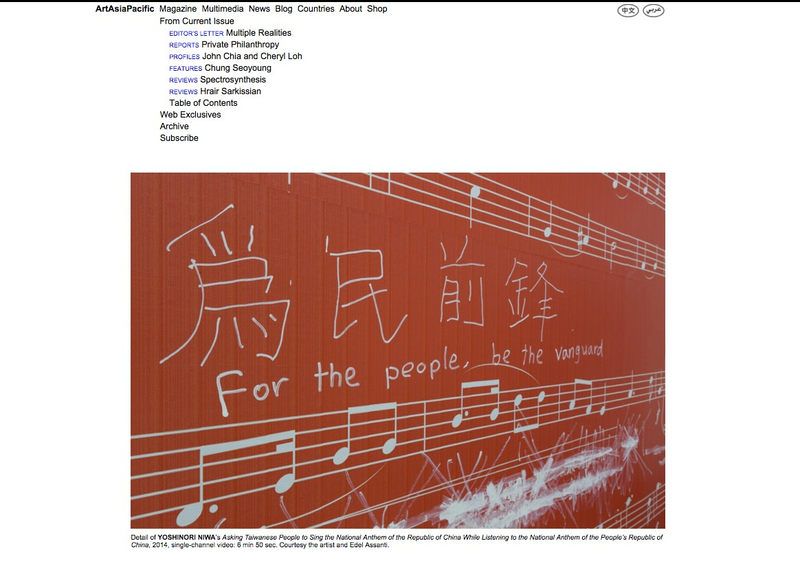 There is an additional layer of complexity, however, in that the artist is naturally asking only a very small selection of Taiwanese citizens to make the statement at random, and thus forces a connection between the individual and the entire populace through a shared national identity—if the statement is to be true, one speaker must speak for all. Niwa’s practice of questioning the legitimacy of ideas by having other people perform speeches also challenges the limitations of language. In Forcing People to Speak About Something They Don’t Understand (2017– ), the artist’s girlfriend—who is Hungarian and does not understand Japanese—reads a detailed phonetic transcription of a speech by Japanese prime minister Shinzo Abe that is, according to the artist, sufficiently accurate for a native speaker to comprehend. As before, a simple, playful action creates room for much deeper concerns. Adding to the uncertainty that one person can never fully understand the meaning of another, the video implies that it’s possible, sometimes, that we don’t even understand ourselves, that a speaker and their intention can be disassociated from their speech. The fourth and final video, Resending Postcards Sent During the Cold War to the Intended Recipients (2017), sees the artist visiting flea markets in Vienna and Budapest, buying postcards and sending them to their originally intended addresses. The piece was something of an outlier within the exhibition, in that it draws attention to a boundary that no longer exists rather than questioning the meaningfulness of one that does. Nonetheless, it supported the exhibition’s central thesis—conveyed with a directness and simplicity to which more idea-driven art might do well to aspire—that many such perimeters are contingent, rather than concrete. Yoshinori Niwa: That Language Sounds Like a Language on view through Thursday December 21 at Edel Assanti.